If you’re a frequent Macworld reader, the topic of “good” passwords is unlikely to be new to you. My colleagues and I never seem to tire of recommending the use of a password manager to help you keep tabs on your digital secret handshakes—alongside other bits of private data like credit card numbers—and avoid falling into bad practices that can have dire consequences on everything from your job to your finances. Luckily, Apple’s software ecosystem suffers from no shortage of apps dedicated to this very goal; among these, AgileBits’ 1Password (Mac App Store link) has always occupied a genre-defining role as one of the most comprehensive solutions available. 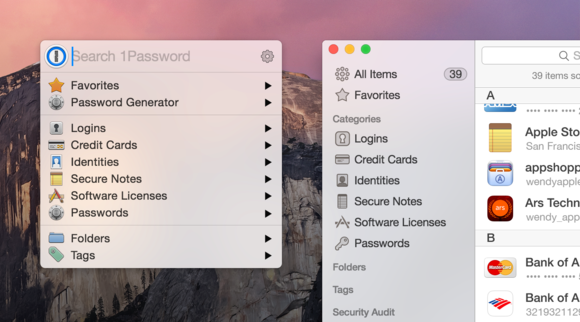 Their latest release, 1Password 5.0, is no exception. One of the hardest feats to pull off in software development is designing a user experience that feels familiar and yet conforms to new paradigms: On one hand, you don’t want the app to look dated or out of place in its intended running environment; on the other, you don’t want to introduce changes so drastic that existing users will suddenly find themselves disoriented and incapable of performing tasks that were hitherto second nature to them. Launched to coincide with the release of OS X Yosemite, 1Password 5.0 aces this particular problem by limiting its user interface changes to a fresh coat of paint that looks perfectly at home inside Apple’s latest operating system. With the exception of a little more flatness, therefore, you can literally install the new version over the old one and continue using it without skipping a beat. 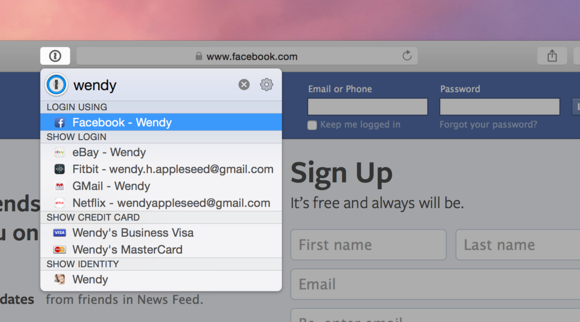 The 1Password Mini helper app (which sits in the menu bar and provides a quick way to grab a password or credit card number without having to launch 1Password), has received more significant interface changes. In its latest incarnation, the helper sports both dark and light interfaces to match Yosemite’s menu bar, and can be quickly invoked with a global keyboard shortcut that makes it appear in the middle of your primary screen. Again, no paradigm-shifting changes, but a few nice touches that, as a frequent user of this feature, I’ve found very useful. 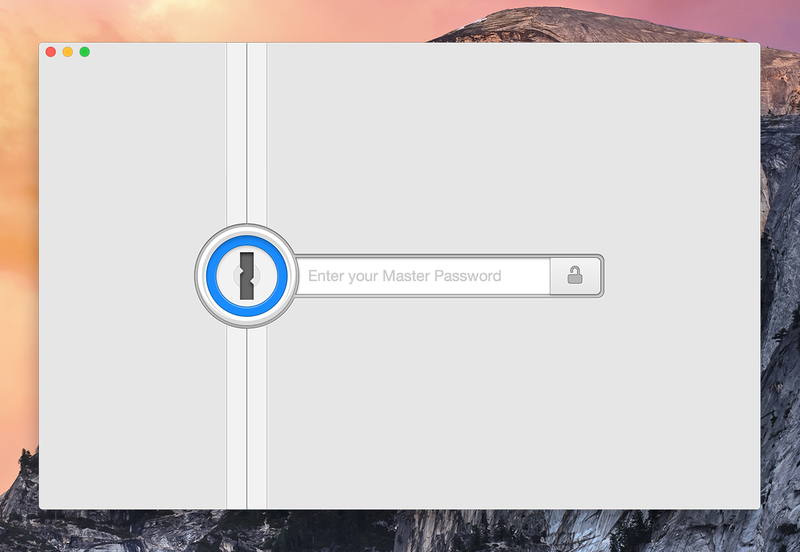 1Password's interface has been redesigned for Yosemite, but still matches its predecessor in all the important details. Outside of these cosmetic changes, most of the functionality provided by 1Password remains unchanged—not a bad thing if you consider that the established user interface works very well. Of note, the iCloud sync functionality has been rewritten from scratch using the new CloudKit framework, which will hopefully bring increased stability to those who choose to store their 1Password vault using Apple’s cloud storage solution. One feature that I think will get more use is the ability to securely share passwords and other bits of private data. This has existed inside 1Password since at least version 3, but was rarely used by regular users, if only because online privacy and security issues affected just an unlucky few. Given Apple’s big push in this arena—and the birth of technologies like Family Sharing—I expect that 1Password’s sharing will be more commonly used. Given that, I hope that AgileBits will find ways to improve the functionality to provide multi-user sync in the future. Even though password sharing is generally frowned upon in the security community, it is sometimes necessary when dealing with service providers that don’t allow multiple logins to the same account (a more widespread problem than you'd think, particularly in the IT community). 1Password Mini, which sits quietly in the Menu and gives you quick access to your vault without having to launch the full app, has probably received the most significant changes as part of the product's redesign. I have very few negative things to say about 1Password. I’m glad that the AgileBits folks decided to forego a major update just for the sake of piling on new features over their existing software, and instead chose to perfect the existing user experience with a number of small but significant improvements. That said, for the first time since I started using the app several years ago, I had trouble installing 1Password on my Mac. I’ve been running Yosemite in its own partition alongside my previous installation of Mavericks—which also contains an older copy of 1Password. When I upgraded to 1Password 5, Yosemite decided to open the main 1Password app from the new download, but then tried to run the 1Password Mini helper—which runs as a separate executable—from my Mavericks partition, resulting in a cryptic “Cannot launch 1Password Mini” error. The solution turned out to be as simple as removing the old copy of 1Password from my Mavericks partition, but it took several minutes to figure out. I imagine that a less technically-inclined user would have had a much harder time figuring things out. I hesitate to blame AgileBits for this problem—a half-dozen things had to go wrong in order for it to happen—but in the end there was no good reason for Yosemite to run half of one version of 1Password and half of the other. The app comes with extensions with all major browsers. With Safari, this means the occasional fight with iCloud Keychain. As a well-supported app that receives frequent updates, 1Password 5.0, which clocks in at just under 31MB and requires Yosemite to run, is well worth its $50 price—particularly if you consider that, if you already own a copy of version 4, you will be able to upgrade for free. The price of the app is even easies to digest now that you can purchase a single copy from the App Store and share it with every member of your family through Family Sharing. Not only does this give you an opportunity to introduce your loved ones (particularly children) to the importance of good password practices, it also allows you to spread the safety 1Password provides to all your data, and at no additional cost. This is a great deal by any measure. The latest release of AgileBits' password manager is as good as ever—and a perfect companion for OS X Yosemite.